-	CEEOL (Central and Eastern European Online Library). The journal provides an ideal opportunity for authors to articulate and present their scientific knowledge with the aim of extending the existing knowledge in these areas and provides an opportunity for young authors at the beginning of their career who want to gain scientific and research recognition both within the domestic and in the international scientific community. With the establishment of college "CEPS - Center for Business Studies" the idea emerged to start a scientific journal that would represent the result of the need for pointing out the important issues in the field of technical and social sciences, especially transport, energy, health and safety at work and fire protection, economy, criminology, in theory and practice. College "CEPS – Center for business studies"
-	pages have to be numbered. -	at the end of the work, the numbered list of literature used is stated, arranged alphabetically by authors' last name, which does not perform selection of sources (for monographs, journals, proceedings, archival materials, websites, etc.). -	submitted texts should be edited. Each author should submit a statement that the work is copyrighted and that has not been previously published, nor will be offered to another journal for publication. Without these elements no work will be published. We ask authors to adhere to the Harvard system of quoting. In the Harvard system of citation bibliographic notes in brackets in the text are listed in the following order: author's name, followed by the year of publication of this text. For example: (Imamović, 2008). -	books with more than four authors. Talović, M. et al., 2011. Notacijska analiza u nogometu. Sarajevo: Fakultet sporta i tjelesnog odgoja. -	Šunjić, M., 1996. Odnosi Bosne i Venecije u vrijeme vladavine Tvrtka I. U: Šunjić, M. Bosna i Venecija (odnosi u XIV i XV st.). Sarajevo: HKD Napredak. pg. 53-79. -	Dizdar, S., 2010. Slika stanja Bolonjskog procesa u Bosni i Hercegovini. U: Mitrović, P. ur. Zbornik radova sa međunarodnih okruglih stolova o implementaciji Bolonjskog procesa u Federaciji Bosne i Hercegovine. Mostar: Federalno ministarstvo obrazovanja i nauke/znanosti, pg. 13-61. -	Grubiša, D., 2011. Politološke dvojbe u Europskoj uniji: potraga za određenjem. Politička misao, 48 (2), pg. 61-90. 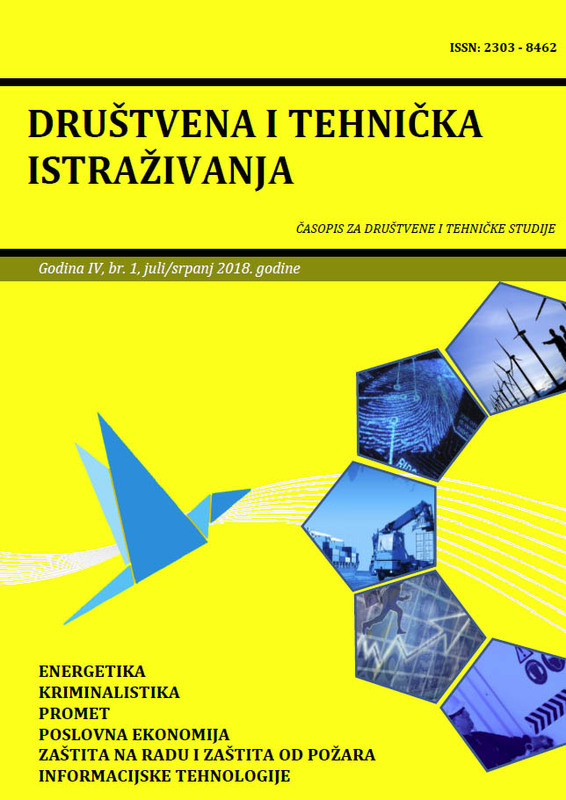 Papers are published in Croatian, Bosnian and Serbian language (in Latin or Cyrillic alphabet) or English. If the manuscript meets the criteria of the magazine, it is fowarded to review. Each manuscript is evaluated by at least two reviewers, with the identity of the authors and reviewers remain mutually unknown. After evaluation of the reviewers and members of the editorial board, the manuscript is returned to the author with an explanation and requirements for revision and correction of work, if it deems it necessary. Authors should return the corrected manuscripts to the editorial office within 15 days of receipt. It is assumed that articles and other contributions have not been and will not be published in other publications, except with special approval of the editorial board, in that case it is clearly indicated in the publication. The authors allow the journal to post their work on the journal website. The journal reserves all other rights, unless otherwise is agreed with the author. The document should be made in Microsoft Word. There must be no indication of personal identity of the author or the institution in which any of the authors work, as in the work, so not in the characteristics (properties) of the electronic document. Papers submitted to the Editorial Board should be edited.